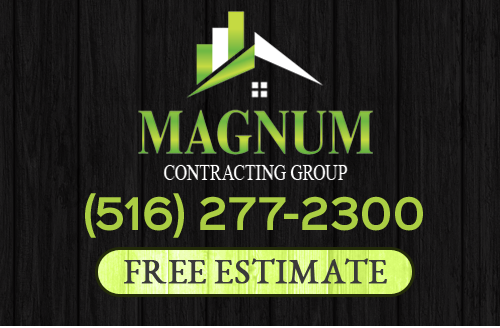 Magnum Contracting Group maintains a consistently high level of professionalism and responsibility in each home improvement job we perform. Our Carle Place roofing and remodeling services meet or exceed the expectations of every client. Our company helps repair and beautify your largest investment -your home. Our clients expect the courtesy and convenience of working with professionals who provide service excellence. If you need reliable Carle Place roof repairs, installation, kitchen remodeling, bathroom remodeling, basement remodeling, extensions, or anything else, you can count on Magnum Contracting Group. Are your roof shingles aging? Have they been damaged recently by a storm? If so, it's important to have a Carle Place roofing contractor take a look to see if they can be repaired. Roof repairs are vital to keeping the home exterior waterproofed. When shingles age or get damaged, they need to be replaced as soon as possible to avoid damage to the interior structure. Even wet insulation can cause mold and mildew to grow. Once it does, there's more to repair in addition to mold remediation measures. Call Magnum Contracting Group as we are professional in Carle Place who offer roof repairs, replacement, and inspections. Let us help you restore your Carle Place roof to good condition. We also help with fire damage repairs and any insurance claims involved. It would be really fun and exciting to remodel your kitchen in Carle Place. But this could easily turn into a nightmare at the slightest oversight. If setbacks occur, it can delay the project or go over the budget. This means you need professional remodeling contractors who won't let this happen. With Magnum Contracting Group, all bases are covered to ensure your kitchen remodeling project finishes on time and within the targeted budget. Let us work out a plan to renovate your old kitchen. You're going to love the changes we can help you with! If you need roofing or remodeling services in Carle Place, NY, give Magnum Contracting Group a call today at 516-277-2300 or complete our online request form.